Posted April 6, 2018 by Lindsey Davies & filed under Our team. Considered to be part of the furniture (in a good way!) 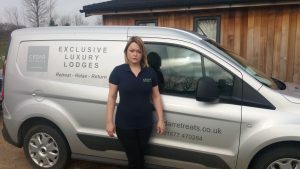 Senior Housekeeper, Mandy Yeatman, has been with the team at Cedar Retreats for more than four years. In that time she has seen the park become what it is today; a tranquil and relaxing retreat for guests and owners alike. Like any business, tranquil and relaxing perhaps isn’t how the staff would describe what goes on behind the scenes, but Mandy says that despite having a to-do list as long as your arm what makes working at Cedar Retreats so great is that no two days are ever the same. She comments: “I’ve almost been here as long as the park itself, which is something I’m really proud of. Things have changed and certainly developed as I have watched the luxury lodges go up one by one and have seen so many happy guests come and go. Responsible for maintaining the high standards of lodge housekeeping, Mandy is never short of a task and managing the other seven housekeepers into teams on each of the Monday and Friday changeovers certainly keeps her on her toes. Ensuring that each and every lodge is cleaned and ready for the next guests arriving and that any general maintenance work is complete is absolutely essential if Cedar Retreats is to give the experience that we have become renowned for. It’s not all work and no play for Mandy though, outside of the day job she enjoys a calmer past time and can be found painting and drawing. Admitting that art was her favourite subject at school, when asked to describe herself in three words she chooses: outgoing, fun, caring and naughty. We’re pleased that maths wasn’t top of the list – that’s four words Mandy!